I have a fondness for light incense fragrances such as L’Artisan Parfumeur’s transportive Passage d’Enfer. 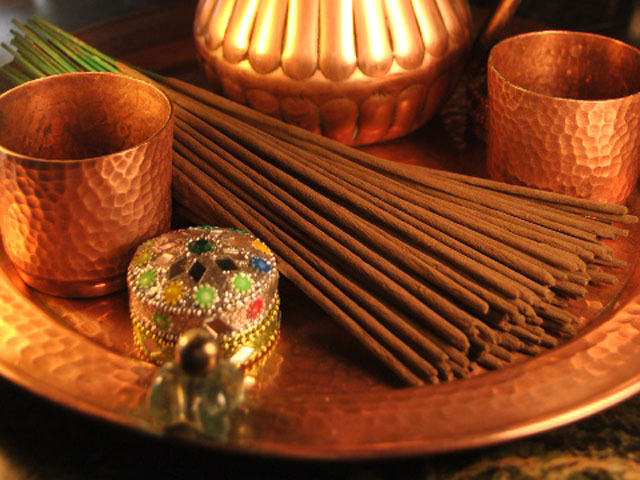 Therefore I’ve long been eager to try another reputedly airy incense which was released back in 1997 – Shaal Nur. I’m grateful to an Aussie pal for sending me a large decant of the EDT earlier this year. I am instantly intrigued by Shaal Nur‘s strange opening which contrasts bright and crisp citrus against a decidedly dark and dusty background. The incense is very gently spiced and reminds me of the (unlit) joss sticks I have from India. There’s also lots of vetiver, old-school patchouli and that “forest floor” effect which is created by woods and leafy, aromatic herbs. I also notice a light rose note, but only if I get in close. Shaal Nur is more multi-faceted than a straight-up incense fragrance but if I were to categorise it under just one accord, that would be vetiver. I have issues with most vetiver-heavy perfumes but not this one. The vetiver here is musty and well blended with earthy patchouli to form the base. It’s at its most prominent once the citrus, incense and vanilla have faded away. Some fragrance fans actually see Shaal Nur as a modern twist on a classic, namely Shalimar. As well as the citrus top notes, I recognise the smoke puffs of opoponax and a dab of sweetness from vanilla. Although, while these elements are also present in the Guerlain, I wouldn’t say the two are smell-a-likes by any means. I see the similarity but would not have independently thought to compare the two. Shaal Nur is a lot darker, less feminine and much more resinous. I picture an antique Indian steamer trunk that has been opened up for the first time in years. It doesn’t possess Shalimar‘s gourmand curves or level of refinement. It’s an accessible oriental which is wearable year-round because it isn’t at all heavy. In fact, it would probably work better in warmer weather because it might get muffled under layers of winter clothing. I find that it wears close to the body, giving it an attractive intimate feel. Longevity is far better than that of your average Eau de Toilette. Shaal Nur has a subtly exotic, enigmatic character and I can envision the Indian Queen that Etro say its name represents. I think it’s striking but I also find it grounding. Shaal Nur imparts a feeling of calm and inner strength, with added interest and a touch of mystery. Have you tried Shaal Nur or any of the other fragrances by Etro?. This entry was posted in By Tara, Fragrance Reviews, Spicy and tagged Etro, Fragrance, Perfume, Review, Shaal Nur. Bookmark the permalink. Hi Tara, what a wonderful review. I must try this one again. The last time I tried this in rush, I was more intrigued by messe de minuit. I eventually bought that, in fact found an older version on eBay. However sadly I think I prefer the newer version as that has more myrrh on your face 🙂 I love that gummy note. At least I won’t now keep wondering how the older version was. I’ll put the older version on eBay soon and buy a new one. I think you’d like Shaal Nur. Let me know when you try it. Hi Tara! Lovely review of a great little fragrance. Soooo glad you liked it! 🙂 interesting that you mentioned Passage d’Enfer – I have a full bottle of this as well and really enjoy it as a cool incense. I think Shal Nur will be my SOTD tomorrow …. Yay. Thanks for the decant Tina! I’ve really enjoyed it and it’s good to find a vetiver I can wear. I like the mustiness of it. I’m really looking forwward to getting out my botttle of Passage d’Enfer this autumn. Love it. Asali, I really like the grounding/centring effect I get from Shaal Nur. I think it has a nice balance. Yes, it is funny about Shalimar, I agree people see all sorts of things in it and that must be partly why it’s so great. I’ll be interested if any commenters get the comparison. Hi Tara, I’m glad to see a review of Shaal Nur, a terrific summer incense in my opinion; love that cool forest floor effect. Etro seems to fly a bit under the radar these days and I didn’t much care for the last couple of releases, but Messe di Minuit is another that I crave in the summer, it’s such a chilly incense that it’s like a bit of private air conditioning. I also like Heliotrope, Sandalo, and some other decants I have around somewhere. Thanks for the review! Nice to see you, ringthing. Etro does seem to be one of those lines that’s in the background but has a few fragrances with a good reputation. I love the idea of having a perfume that’s like private air conditioning. Great description. Tara, I have tried only two or three Etro scents, and the one that I enjoyed the most was an arid green scent called Palais Jamais, which I had a decant of when I first discovered the perfume blogs and started swapping packages. (Wow, that seems like forever ago!) Your review of Shaal Nur is beautiful – it sounds like a very quietly dignified amber, calming and perfect for this time of year, when the end of summer makes me feel kind of drowsy, in general. Lovely review! Suzanne, so lovely that you commented today because I dreamt we met last night! Mad. Shaal Nur is perfect for the end of summer. i have that drowsy feeling right now. I haven’t heard of Palais Jamais so I’ll have to look for it. Nice to hear it was one of your first decants. Oh those heady early days feel so long ago, don’t they? Oh Tara, you made my day! I would love to meet you in person, so I hope your dream comes true at some point. I’d love to get back to Europe (there’s so many countries I’ve never been to, including yours), so hopefully we will. And yeah, those heady days when perfume collecting was new! It was such an obsessive and magical time. Sigh…. I’ll keep my fingers crossed then, that you do another tour of Europe one day and stop off in the UK. It would be so great to meet up – for real! “Obsessive and magical” really sums up those early days. Shaal Nur is one of my faves from the Etro line up. It has been in and out of carts and baskets for years but always something else trumps it and so I don’t yet have a bottle. My fave Etro is, of course, discontinued. It’s called Relent and our hotel in Venice used it as their body wash and I fell madly in love. It took me ages to track down a bottle and I also bought a few body washes. I know I’m treating myself when I use them and it always takes me back to Carnivale in Venice and our lovely room overlooking the terracotta rooftops to the canal. Portia, I can imagine that happening with the shopping cart because while there’s something mysterious about it, it’s not going to get your heart racing like some frags out there. I loved reading your memories of Relent and Venice. Another place I want to visit one day. Now you’re also mentioned the body line I’m very curious about it. Thanks, Sandra. With a Bank Holiday on Monday and a day of with my niece yesterday, it’s been a lovely, quick week! Hope you guys are all well. Will drop you a line soon. I was also pleased to see this scent featured and you have completely nailed it again in your evocative review. I especially liked the antique steamer trunk analogy. I haven’t smelt Shaal Nur in forever, but that odd counterpoint of citrus and dusty incense is how I remember it. And the resinous quality and odd joss stick puff. I agree with the previous commenters that Etro doesn’t get much attention. Undina introduced me to Rajasthan, which is very nice, and I have a big decant of the coolly woody Etro Etra somewhere. It’s good to hear my experience of Shaal Nur chimes with yours, V. It was nice to get to try it properly after being curious about it for so long. I wasn’t sure which one Undina had, but I remember her pic of the gorgeous bottle. It seems Etro have a talent for cool scents. 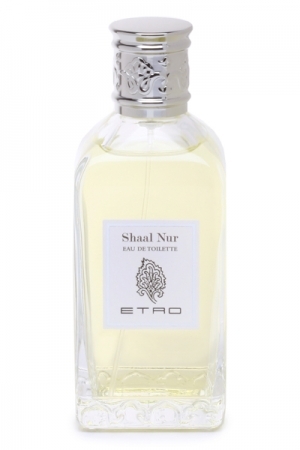 Ha – Shaal Nur (and Messe de nuit) have been on my to-smell-list since those ‘early’ days, when I used to make ‘smell’ lists based on Robin’s blog – I remember she really liked Etro. I still haven’t managed to smell Shaal Nur. I did get a sample of Etro something in a swap ages ago – I forget which it was. Etra. maybe? Will check. I remember all those “To Try” lists. Yes, Robin does seem to be an Etro fan. I guess she likes the quieter style. I really think you’d get a kick out of Shaal Nur. I hope you get hold of some. Well, I don’t think Shaal Nur resembles Shalimar much but see what you think if you do ever come across it.